Have you been looking for a career that is specialized, challenging, and rewarding? Do you want to work in an environment where your passion is supported by new technology, diverse opportunity, and dedicated teammates? According to Kat P., Echocardiography Sonographer at UPMC Presbyterian, echocardiography could be the answer for you. 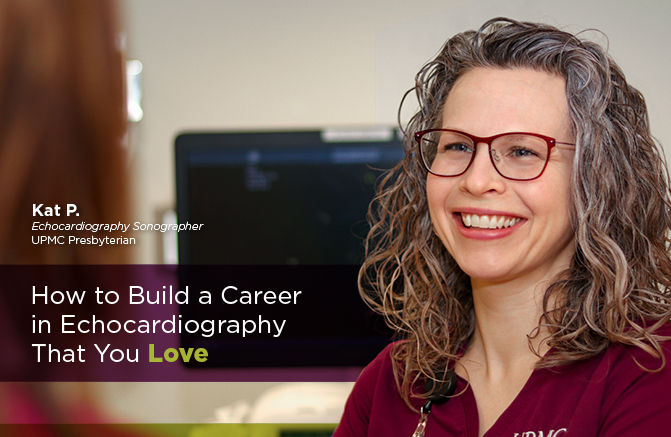 Kat took us behind the scenes of her own career to reveal why her work as an echocardiography sonographer means so much to her and to offer some guidance for how you can find the same career success. While Kat felt drawn towards medicine from a young age, she had to do some exploring to find the career that was right for her. “I was always interested in science, and I got my degree in molecular biology. After graduation, I worked in a research lab for a year and discovered I wasn’t really happy in that field. I was interested in the medical field, so I decided to look into the imaging specialties,” Kat said. Over the course of her career as a sonographer, Kat has developed consistent routines and skills that allow her to be her best every day. Yet at the same time, she keeps things fresh by embracing the variability that each new day in the echocardiography lab brings – something that she loves. So you’ve landed your dream job – now what? Don’t miss out on opportunities around you to continue learning about your field and improving your work. For Kat, she has found that UPMC Presbyterian is the perfect place to do that. “I’m obsessed with optimizing my studies and making each image the best quality possible. I love learning about and working to perfect new techniques, like 3D echo. I strive to learn as much as possible about everything pertaining to cardiology in order to keep improving as a sonographer. As an echocardiography sonographer at UPMC Presbyterian, Kat benefits from the cutting-edge technology, educational opportunities, and top-tier coworkers who surround her every day. Are you ready to join Kat and our team of Life Changers at UPMC? Click the button below to view current openings for Echocardiography Sonographers.